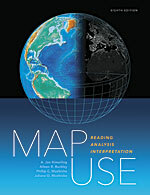 Map Use: Reading, Analysis, Interpretation, Eighth Edition, is a comprehensive, foundational textbook designed for college curriculum. With a new chapter on map design—including for web maps—the new edition also addresses contemporary topics on cartography, such as web concepts and the use of imagery and remote sensing. Map Use not only imparts to students the skills they need to read and understand maps, but it can also be a thorough reference resource for professional cartographers. It features nearly 600 full-color maps, photographs, and graphs that illustrate the big ideas behind communicating with maps and has an extensive glossary that defines key topics. Accommodating current developments in mapping, GPS, and GIS technology, the eighth edition renders basic cartographic principles accessible to all—from students of cartography and map design to those without a formal geography education. October 2016 (e-book) and November 2016 (print), 670 pp. E-book ISBN: 9781589484696 and paperback ISBN: 9781589484429. Get information about all Esri Press publications.